Home Sheridan & Mary Waldron Women umpiring duo to rewrite history in Adelaide. Women umpiring duo to rewrite history in Adelaide. 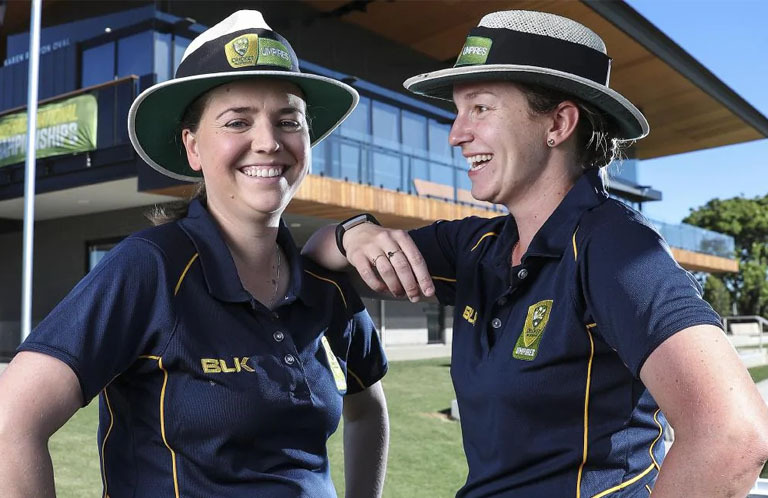 Umpires Eloise Sheridan & Mary Waldron are on the verge of making history as they will be the first female duo to officiate in a men’s first-grade premier cricket match, this weekend. Sheridan and Waldron will stand in a match between Tea Tree Gully and Northern Districts in Adelaide featuring Australia’s vice-captain Travis Head. For Sheridan, officiating in a men’s cricket match is not something new as she stood as an umpire in a South Australian Premier Cricket first grade game, 18 months ago. Earlier, she and NSW umpire Claire Polosak officiated in a Women’s Big Bash League match between the Adelaide Strikers and Melbourne Stars to be the first female pair to officiate a professional match in Australia. Waldron, on the other hand, will be officiating in her first men’s grade match. She played for Ireland in last year’s International Cricket Council (ICC) T20 World Cup and was also a professional football player. To have so many firsts for female umpires in our State in recent times has been wonderful to see. This achievement for Eloise and Mary is very significant as an Australian first and speaks volumes about how hard they have both worked on their development over the past few seasons, Cricket.com.au quoted SACA State Umpire Coach Daniel Goodwin, as saying. Our umpires are all appointed to matches on merit and both women are very deserving of the position they are in and the opportunities that are being presented to umpire high-level games, Goodwin added.